If politics don't work they can always sell timeshares. Run away, run away, the sky is falling, the world will end in 12 years if we don’t save the climate. 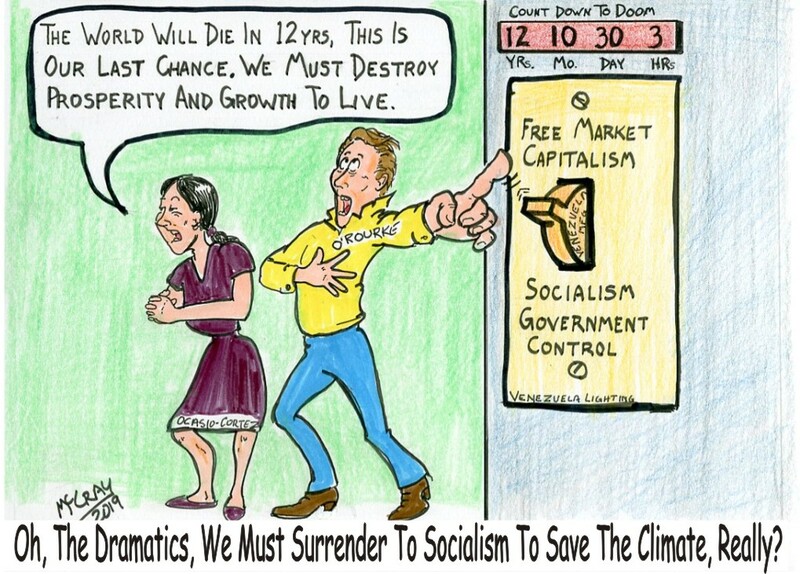 We have to throw the magic switch to go from a Free Market Capitalist System to Socialism where everything is controlled by the government. This is the latest pile of feathers thrown in the air by those running for President under the banner of the so-called Democrat Party. First, it was Global Warming, then when the facts showed that the earth has entered into a cooling trend and the sun has entered into reduced sunspot activities, called a solar minimum. Then it was changed to a political definition of climate change, you can’t go wrong there, the climate changes every day. Perfect for the scammers and the gullible to scream about, even though real scientists and climatologists whose paychecks are not tied to politically oriented and funded organizations have proven that our climate is moving at its own pace. The socialist activists that run the school systems make it a point of not informing the students that the end of the Ice Age was brought about by the earth being in a warming trend. This is a perfect situation for the scammers in world politics to use as a tool to control other countries; this was the purpose of Kyoto Agreement in Japan, which fortunately the United States did not sign. It would have put controls on our country, business, and the daily lives of everyone. One just has to look at the European Union’s practice of dictating to member countries as to how their countries are to be run, as a good example of what would happen if the United Nations was in the driver’s seat. You would hear a loud sucking sound as wealth of the United States was pulled into the corrupt United Nations. Every time we hear a doomsday prediction, there’s a political agenda hidden behind it and the motivation is political control for the so-called greater environmental good. An article by Maxim Lott on Foxnews.com covers ten different times ‘experts’ predicted the end of the world, starvation, excessive cold weather, radiation, etc… Any chance for survival lay with massive governmental controls on everyone’s life. All of the gloom and doom, promises of everything that’s free, free, free for your vote in their favor, is the result of flailing left-wing politicians not having a relevant message that will truly help the country. All of this free stuff costs money, but who is going to pay for it? - the same people who are paying now, the taxpayers. The predictions of the cost of this Green New Deal being pushed by Ms. Ocasio-Cortez will saddle every household in the U.S. with a $600,000.00 debt. Now the left is spouting about changing the constitution, changing the number of Justices on Supreme Court, getting rid of the Electoral College, lowering the voting age to 16, anything that might help them win an election. They can’t win an election the fair way as the election rules define, so they want to cheat by changing the rules so that they are the only winners. The further left and more extreme the so-called Democrat Party gets, the more they will run people off that don’t agree, the smaller and more isolated they will become, and in the end, most irrelevant. the same people who are telling us that the earth is very suddenly going to destruct in a mere twelve years are the same people that tell us how the earth has endured 4.5 billion years of evolution. apparently the earth has developed Alzheimer's in its old age and can't remember how to exist. fortunately, the earth has Ocosio-Cortez to the rescue. I find it difficult to grasp how even one person could have voted for the prom queen but here she is in office. still, she would not be crowing about 12 years if she didn't believe that people would join her. so, if we are blown away by her sheer stupidity, what does that say about the stupidity of those who embrace her stupidity. although, if we abandon Israel as many liberals are wont to do, we very well could see the end in twelve years. it just won't be the way the prom queen imagines.